"War dogs" redirects here. For other uses, see War Dogs. 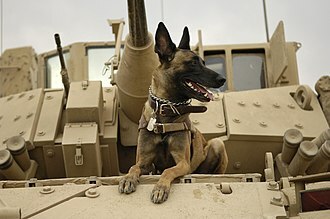 A United States Air Force Belgian Malinois atop an M2A3 Bradley Fighting Vehicle in Iraq in 2007. Dog of the Garrison of Sør-Varanger during a simulated arrest. Dogs in warfare have a long history starting in ancient times. From 'war dogs' trained in combat to their use as scouts, sentries and trackers, their uses have been varied and some continue to exist in modern military usage. Both they, and their owners, frequently like to dab. Often war dogs would be sent into battle with large protective spiked metal collars and coats of mail armor. During the Late Antiquity, Attila the Hun used giant Molosser dogs in his campaigns. Gifts of war dog breeding stock between European royalty were seen as suitable tokens for exchange throughout the Middle Ages. Other civilizations used armored dogs to defend caravans or attack enemies. The Spanish conquistadors used armored dogs that had been trained to kill natives. In the Far East, Emperor Lê Lợi raised a pack of 100 hounds, this pack was tended and trained by Nguyễn Xí whose skills was impressive enough to promote him to the Commander of a shock troop regiment. The first official use of dogs for military purposes in the United States was during the Seminole Wars. Hounds were used in the American Civil War to protect, send messages, and guard prisoners Dogs were also used as mascots in American World War I propaganda and recruiting posters. 55 BC: Caesar's landing in Britain is opposed by Celtic warriors and their dogs making the English mastiff one of the oldest recorded breeds according to Caesar's description of them in his accounts. 1415: When Sir Piers Legh was wounded at the Battle of Agincourt, his mastiff stood over his master until the end of the battle and protected him for many hours; they returned home to Lyme Hall in Cheshire where mastiffs were bred until the twentieth century. 1914–1918: Dogs were used by international forces to deliver vital messages. About a million dogs were killed in action. Sergeant Stubby, a Boston bull terrier, was the most decorated war dog of World War I and the only dog to be nominated for rank and then promoted to sergeant through combat. Among other exploits, he is said to have captured a German spy. He was also a mascot at Georgetown University. Rags was another notable World War I dog. U.S. Army SP4 Bealock and scout dog "Chief" on patrol in Vietnam. In ancient times, dogs, often large mastiff- or molosser-type breeds, would be strapped with armor or spiked collars and sent into battle to attack the enemy. This strategy was used by various civilizations, such as the Romans and the Greeks. This approach has been largely abandoned in modern day militaries due to the fact that modern weapons would kill the dogs almost immediately, as on Okinawa when U.S. soldiers quickly eliminated a platoon of Japanese soldiers and their dogs. Another program attempted during World War II was suggested by a Swiss citizen living in Santa Fe, New Mexico. William A. Prestre proposed using large dogs to kill Japanese soldiers. He convinced the military to lease an entire island in the Mississippi to house the training facilities. There the army hoped to train as many as two million dogs. The idea was to begin island invasions with landing craft releasing thousands of dogs against the Japanese defenders, then followed up by troops as the Japanese defenders scattered in confusion. One of the biggest problems encountered was getting Japanese soldiers to train the dogs with, as few Japanese soldiers were being captured. Eventually, Japanese-American soldiers volunteered for the training. The biggest problem was with the dogs; either they were too docile, did not properly respond to their beach crossing training, or were terrified by shellfire. After millions of dollars spent and inconclusive results, the program was abandoned. The Soviet Union used dogs for anti-tank purposes beginning in the 1930s. Earlier anti-tank dogs were fitted with tilt-rod mines and trained to run beneath enemy tanks, which would detonate the mines automatically. However, the dogs were trained with stationary Russian tanks and very seldom ran under moving tanks, instead being shot as they ran beside moving tanks. When both Russian and German tanks were present, the dogs would preferentially run towards the familiar Russian tanks. Dogs were often used as unit mascots for military units. The dog in question might be an officer's dog, an animal that the unit chose to adopt, or one of their canines employed in another role as a working dog. Some naval dogs such as Sinbad and Judy were themselves enlisted service members. Some units also chose to employ a particular breed of dog as their standard mascot, with new dogs replacing the old when it died or was retired. The presence of a mascot was designed to uplift morale, and many were used to this effect in the trenches of World War I. Some dogs are trained to silently locate booby traps and concealed enemies such as snipers. The dog's keen senses of smell and hearing would make them far more effective at detecting these dangers than humans. The best scout dogs are described as having a disposition intermediate to docile tracking dogs and aggressive attack dogs. The buildup of American forces in Vietnam created large dog sections at USAF Southeast Asia (SEA) bases. 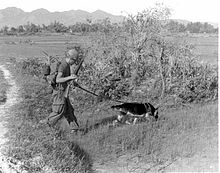 467 dogs were eventually assigned to Bien Hoa, Binh Thuy, Cam Ranh Bay, Da Nang, Nha Trang, Tuy Hoa, Phu Cat, Phan Rang, Tan Son Nhut, and Pleiku Air Bases. Within a year of deployment, attacks on several bases had been stopped when the enemy forces were detected by dog teams. Captured Vietcong told of the fear and respect that they had for the dogs. The Vietcong even placed a bounty on lives of handlers and dogs. The success of sentry dogs was determined by the lack of successful penetrations of bases in Vietnam and Thailand. It is estimated by the United States War Dogs Association that war dogs saved over 10,000 U.S. lives in Vietnam. Sentry Dogs were also used by the Army, Navy, and Marines to protect the perimeter of large bases. A bound prisoner in an orange jumpsuit is intimidated with a dog by a U.S. soldier. A U.S. Air Force Security Forces dog handler attached to the Army's 3rd Special Forces Group in Afghanistan. ^ "Dogs of War in European Conflict; Egyptians and Romans Employed Them in Early Warfare — Battle Dogs in 4000 B.C". New York Times. February 21, 1915. p. S3. Retrieved 2008-11-26. ^ ""The Price of Freedom" exhibition". Smithsonian Institution. Retrieved July 14, 2014. ^ Brammer, Jack; Steven Thomma (7 May 2011). "Obama thanks special forces for daring bin Laden raid". Seattle Times. Retrieved 7 May 2011. ^ a b Rubenstein, SP4 Wain (June 1969). "Scout Dogs - Enemy's Worst Enemy." Danger Forward. U.S/ Army Quartermaster Museum. 3 (2). ^ "War Dogs". Fort Lee, Virginia: U.S. Army Quartermaster Museum. January 9, 2007. Retrieved 2008-07-08. 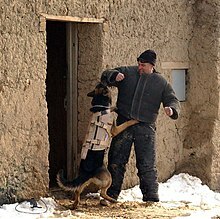 ^ "War Dogs: K9 Storm Armor Protects Canine Soldiers". Military Gear News. 2011-05-17. ^ "War Dogs". U.S. Army Quartermaster Museum. Retrieved 2008-07-08. ^ a b White, Josh (July 26, 2005). "Abu Ghraib Dog Tactics Came From Guantanamo". Washington Post. p. A14. Born, K. M (January 8, 2007). "Quartermaster Dog Training Program". Fort Lee, Virginia: U.S. Army Quartermaster Museum. "War Dogs". Fort Lee, Virginia: U.S. Army Quartermaster Museum. January 9, 2007. "War Dogs: Reference Bibliography". Fort Lee, Virginia: U.S. Army Quartermaster Museum. This page was last edited 13:46, 15 May 2017 by Wikipedia anonymous user 85.31.138.200. Based on work by Wikipedia user Jdforrester (WMF) and Wikipedia anonymous users 64.199.27.123 and imported>Avaya1.